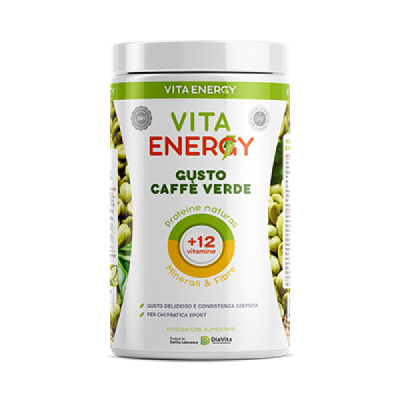 Contains a green coffee bean extract well-known for its incredible antioxidant effects. Ingredients: Whey Protein Concentrate (from milk), Soy protein Isolate, Dietary Fiber (acacia gum, inulin), Soy bean oil, Milk protein isolate (from milk), maltodextrin, flavour (vanilla flavour), thickening agent (guar gum, xanthan gum), minerals (potassium citrate, magnesium carbonate, calcium carbonate, iron (II) sulfate, zinc sulfate, potassium iodide, sodium hydrogen selenite, copper (II) gluconate, manganese sulfate). Vitamins (vitamin E (dl-alpha- tocopheryl acetate), vitamin C (L-ascorbic acid), niacin (nicotinamide), vitamin A (retinyl acetate), biotin (d-biotin), pantothenic acid (calcium d- pantothenate), folic acid (pteroylmonoglutamic acid), vitamin B12 (cyanocobalamin), vitamin B2 (riboflavin), vitamin B6 (pyridoxine hydrochloride), vitamin D3 (cholecalciferol), vitamin B1 (thiamine mononitrate)), sweetener (sucralose), colorant (copper chlorophylline), green coffee extract (45% chlorogenic acid) (100 mg).